My Rooms Furniture Gallery features exquisite wooden lateral file cabinets by DMI Office Furniture. Visit one of our convenient furniture store locations or purchase online & we'll ship directly to you anywhere in the US. 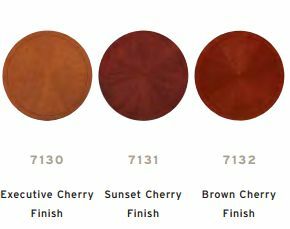 The executive cherry finish is enhanced by elegant details such as inlaid cherry veneer tops bordered by walnut banding and finished with a protective Ultra-Violet topcoat. The black metal hardware is in a semi-matte finish. Show in Executive Cherry Finish (7130). Available in 3 finishes.